I never planned to make this purchase but I was bored and lonely one night, alone at home because the husband is on a long work trip, so I do what I always do – online shop. I did my usual “window” shopping on a few beauty shopping sites to check out what’s new and I suddenly saw this 20% off on the feelunique site, so why not! 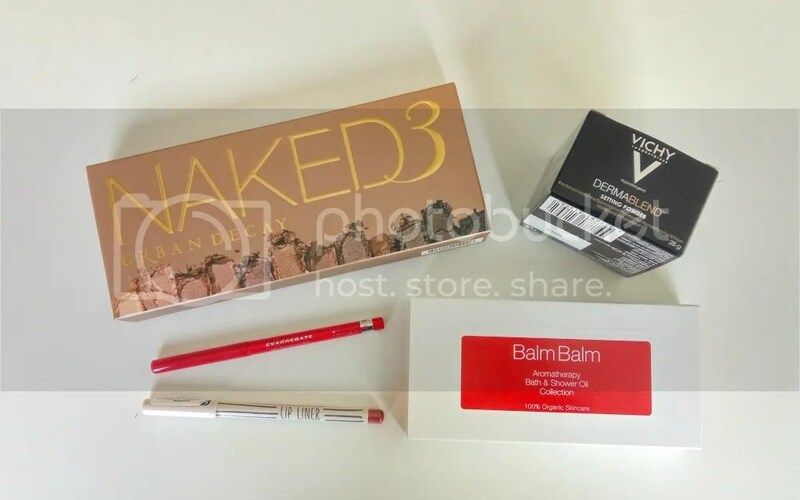 I must be the last person to buy the Urban Decay Naked 3 palette; I’ve always wanted it but I find it hard to justify with what I already have – now I have an excuse because my stash is not with me in Belgium! I also needed some lip liners, so I got the Topshop Beauty Lip Liner in Beestung and Rimmel Exaggerate Lipliner in Red Diva. My current setting powder is also almost at the end of its life, so I bought the Vichy Dermablend Setting Powder; I haven’t tried many Vichy beauty products, only skincare, so I’m excited to try this. I’m also down to my last bottles Aromatherapy Associates bath oils, so I picked up this Balm Balm Aromatherapy Bath & Shower Oil Collection for 30 euros. It’s a nice size haul and it’s not too expensive. The total came up to about 93 euros, versus 120+ euros without the 20% discount, and I would have to buy most of the items anyway even without the discount, so I think it’s a good deal!